Born Dorothy Halliday, on the 25th August 1923 in Dunfermline in Fife, she was educated at Gillespie's High School for Girls, in Edinburgh, and her time there overlapped with Muriel Spark, who later wrote The Prime of Miss Jean Brodie about the same school. Her early career from 1940-55, was with the Civil Service, starting as a secretary at The Scottish Office during the Second World War. Once the war was over she worked at the Board of Trade where she produced detailed reports on Scotland's recovering economy. While at the Scottish Office she met Alastair Dunnett, who was Press Officer to the Secretary of State for Scotland. Love blossomed and after the war they were married in 1946 when he became editor of the Daily Record in Glasgow. A decade later he was appointed editor of The Scotsman, a position he filled with great distinction for 16 years, before moving to the oil industry to play a pivotal role as Chairman of Thomson North Sea Oil. 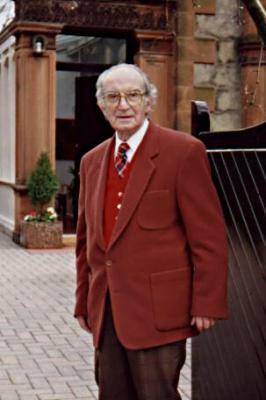 In 1995 he received a knighthood for services to journalism and Scottish life. To universal regret, Alastair died after a short illness at the age of 89 in September 1998. From a young age Dorothy had shown talent as an artist and illustrator, and from 1950, she pursued a parallel career as a professional portrait painter. She exhibited at the Royal Scottish Academy on many occasions and became a fellow, and she had portraits commissioned by a number of prominent public figures in Scotland. Her writing career started in the late '50s, when she complained to Alastair that she had run out of reading material and he suggested she write something herself. Setting to with the erudition and depth of research that was to become her trademark, she spent the next 18 months researching in ever more detail before presenting a large pile of manuscript to Alastair with a request that he read it. That he did, in two nights, and immediately recognised it as a milestone in historical fiction. However five British publishers rejected it and it seems that its length was at least one factor in that. It was then that Alastair contacted a friend in America, Lois Dwight Cole, who had discovered Margaret Mitchell and edited Gone with the Wind. He wrote to her "How would you like to see an astounding manuscript of a story by the wittiest woman in Scotland?" She replied "Send it." A contract swiftly followed and Game of Kings was published by Putman in the USA in 1961, with Cole doing the editing and also selling the UK rights to Cassell who published it the following year. That was how Francis Crawford of Lymond was introduced to a discerning and increasingly enthusiastic readership. The scene was now set and five more volumes of The Lymond Chronicles were written over the next fifteen years, interspersed with the lighter detective novels of Johnson Johnson, the bifocal wearing secret agent, which were originally published under Dorothy's maiden name. By now an acclaimed writer with a mature and confident style, she was asked to produce a single-volume work on a figure from Scottish history. Dismissing the publisher's suggestions of Charles Edward Stuart or Mary Queen of Scots, she proposed the Shakespeare-maligned figure of Macbeth and signed a contract to produce it in a year or two at the most. However once into the research she found herself increasingly coming across the figure of Earl Thorfinn "the Mighty" of Orkney and after many months of studying every related book available (around 700) and as much original material as she could find from all over Europe, she came to the conclusion that Macbeth and Thorfinn were actually the same man. Faced with the dilemma of whether to continue the research and prove her theory or to write the book she had contracted for which was already years overdue, she chose the latter. King Hereafter was eventually published six years late but is regarded by many as her finest work. Following King Hereafter she returned to the Renaissance period for her second series of historical fiction - the 8 volume House of Niccolo. This time, rather than a Scottish nobleman, her main protagonist was a dyeyard apprentice from Bruges, and the initial story followed his rise through his skills of accounting and code-writing. The difference from the life of Francis Crawford could hardly have been more marked, but gradually through the series there appeared subtle connections with the earlier, though chronologically later, story. It eventually became clear that she had produced what was in effect an entire prequel series. In addition to her heavy writing schedule Dorothy also led a busy life in public service. 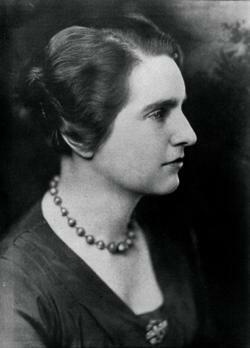 Her positions included: membership of the Board of Trustees of the National Library of Scotland, Trustee of the Scottish National War Memorial, and a Director of the Edinburgh Book Festival, not to mention work on various committees to do with books, films, and cultural subjects. She was also a non-Executive Director of Scottish Television, and a Fellow of the Royal Society of Arts. In 1992 she was awarded the O.B.E. for services to literature. Throughout their married life she and Alastair formed a vibrant partnership for the promotion of Scotland and the development of Scottish cultural life. They were instrumental in the development of the Edinburgh Festival and involved behind the scenes in many other important areas such as Scottish Opera. 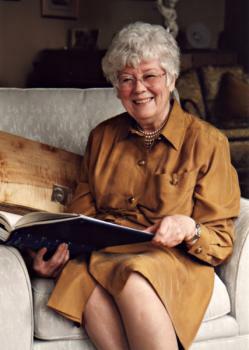 Having completed the House of Niccolo series and attended both the Edinburgh and Philadelphia Gatherings in 2000, as well as speaking at the Adelaide Book Festival in Australia (a trip which I know she enjoyed immensely), she spent many months working with Elspeth Morrison completing the 2nd volume of the Dorothy Dunnett Companion. Shortly after its completion she became unwell and was later diagnosed with cancer of the liver and pancreas. She died peacefully a few weeks later on 9th Nov 2001 in an Edinburgh hospice. Dorothy is survived by her two sons - Ninian and Mungo, one grandson - Halliday, and one granddaughter - Annabella Charlotte. A fuller description of Dorothy's life and work can be read in the text of a talk I gave at the Carnegie Library in Dunfermline. For a long time I have wondered what to do with the old pages which recorded my original announcement of Dorothy's death to her readers and the many heartfelt and moving messages of condolence which were sent in in the weeks that followed. I was conscious that such things should have a finite time-period and I was concerned that her family might prefer that the curtain should be finally drawn. However even many years later I used to receive messages saying how much people appreciated reading them, and they are a remarkable testament to the profound effect that Dorothy had on people's lives. With this new version of the site I felt it was finally time to remove them from view, but then I started reading through them again and, with tears in my eyes despite the passing years, found that I couldn't quite bring myself to remove them completely. So I have reached a compromise. They are no longer directly visible or indexable to search engines, but I have converted the old pages to pdf files and put them into a zip file which can be downloaded by anyone who still wants to read them. I hope this will be a satisfactory approach for everyone concerned.